In Elementary School my favorite part of "Music Class" was when we drew. 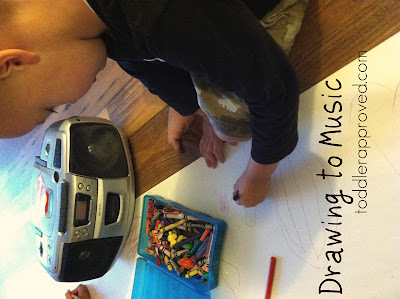 You're not seeing a typo - drawing in music class was something we did often, and I loved it. Our teacher would put on a record (does anyone remember what those were) and encouraged us to draw on paper what we felt through the music. Observing the response that children have to various types of music is so fascinating to me. Before they can talk, read, write, draw - they know how to move to music. This is an excellent activity to help them recognize emotions (through something they already do well "move to music"), and translate that to "drawing" (which we know to be a valuable pre writing skill). This is also a great way to give your children exposure to, and promote an appreciation of, different types of music. There are several ways to do this activity (indoors, outdoors, one large piece of paper, several small pieces, one song, a series of songs, one genre of music, several genres, etc.). On this particular day, I rolled out a long piece of paper from our easel roll, taped it to the floor, and set the radio near our "canvas". Crayons were our medium of choice. Of course, before we started - we danced. I took a moment to (very) briefly ask my children how the particular piece made them feel, how it made them want to move. Then I let them translate that to the paper. It was interesting to watch my younger child consistently draw shapes and squiggles to the beat of the music, or size his drawings based on the volume and intensity of the music. On the other hand, my older child would draw a more complex picture or series of pictures comprising a story that was inspired by the music. Of course, the activity is not finished until you have your child tell you all about (and interpret) their drawing. Today we listened to "Claire de lune" by Claude Debussy while drawing. What song would you choose? I love these ideas, I think they work perfectly well with young learners. I am actually thinking of using some of them while teaching my own kids. It is the great idea! So nice to follow it. Thanks. Really interesting idea, this needs to be done in all schools.